I’m looking at an old photo. It’s 1936 and NYC Mayor Fiorello LaGuardia, with a hand on the shoulder of Joe DiMaggio and the other on Lou Gehrig, is beaming as he welcomes the rookie. DiMaggio would exceed the expectations of everyone and certainly be worth his $25,000 starting salary. The Yankees are the team that I had grown up with. Through the years they’ve had a legion of impressive players and personal favorites. Joltin’ Joe DiMaggio represented many things to me. 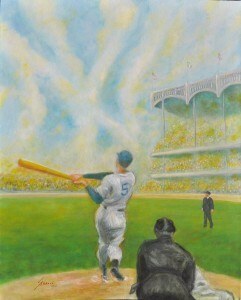 In my painting I have taken a few liberties in portraying a magical moment at Yankee Stadium. The focus is on DiMaggio just after he connects. Everything seems frozen as the skies, which form the Yankee logo, await his home run. It’s a beautiful day and the stands are bathed in sunlight. Atop the stadium facade, the flags gently wave.